Altami VideoKit is designed for controlling video cameras from 0.3 to 5.0 MPix. It allows to make photos and high-quality video. The full-format mode is available here, and there exists a viewfinder. Altami VideoKit application supports the work with different devices: video camera, TV-tuner, and so on. ; and allows to use the whole monitor screen for viewing the image in real time mode; to save the images; to record the videos at the hard disk of the computer and to configure the paths of saving of images and videos. 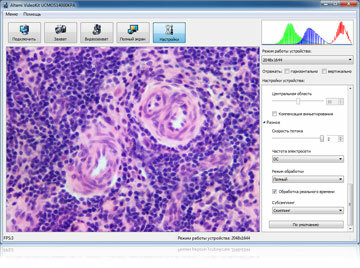 The application fully supports numerous capture devices with Microsoft DirectShow interfaces (the most broadly used in Microsoft Windows operating systems), as well as digital ocular cameras of DCM and MDC series for microscopes. The most popular operating systems: Windows, Linux, Mac OS X – are supported. Demo-version of the application is available for downloading without prior registration or requests. Before taking the decision on purchasing, you can check if the application suits your tasks. If you have any questions, feel free to contact mail@alelso.com. We will answer your questions gladly. Altami VideoKit differs from most of the classical application because capture devices are fully supported. Altami VideoKit allows not only to capture frames from camera, but also to control its settings. The application supports in different operating systems (Altami VideoKit - cross-platform software) the broad range of standrads for capture devices, including Microsoft DirectShow, UVC, unicap, Qt Capture. In this mode the preview window occupies the whole space of the screen, which allows to examine the image details better. The preview image can be enlarged, and the navigator window, which is used for convenient orientation, shall appear. In Altami VideoKit application it is possible to use the whole screen for viewing the image. In order to do that, the user needs just to switch to the fullscreen mode. In that mode all opportunities of the application are available, including capture and application and camera setting. The application allows to perform automatic capture. You can indicate the resolution volume (in pixels) of the image being captured, the more the volume is, the more place the image will take at the disc, and the more time the capture will take. This parameter is especially crucial for video capture. With large resolutions and comparatively small productivity of the computer the “slowing down” of the image is possible. Volumes of all settings at the time of capture influence the saved videos and photos. Saving of settings allows to indicate the rules of creating file names by saving images and control the automatic capture of images. It possible to choose the variant of saving where a standard saving dialogue is called, or you indicate all necessary parameters at once, and the application will form the file name without your participation. In the application a simple and convenient mechanism of profile settings is used. All current camera settings and saving parameters are included into the profile. You can save received captures and copy the videos to the hard disk of the computer. You can also easily and quickly configure the paths for saving images and videos. Altami Studio and Altami VideoKit — the main software products developed by Altami specialists are suitable for controlling many image capture devices (various digital web, video and cameras). These programs are mainly supplied with digital microscopes to digitize the images received from the device and transfer them to the computer for further processing (the latter is possible with Altami's advanced Altami VideoKit). These applications are used to control various camera settings (for example, shooting and saving settings), they can be used to work with the frame stream from the camera. USB 2.0 ScopeTek camera for working with a microscope. Below are the names of the models of these devices that are supported by Altami Studio and Altami VideoKit. You can see a more detailed list of devices that also work with the program and are connected according to the UVC standard: webcams and laptop cameras.